Casey Trees and the District Department of the Environment (DDOE) have done it again. 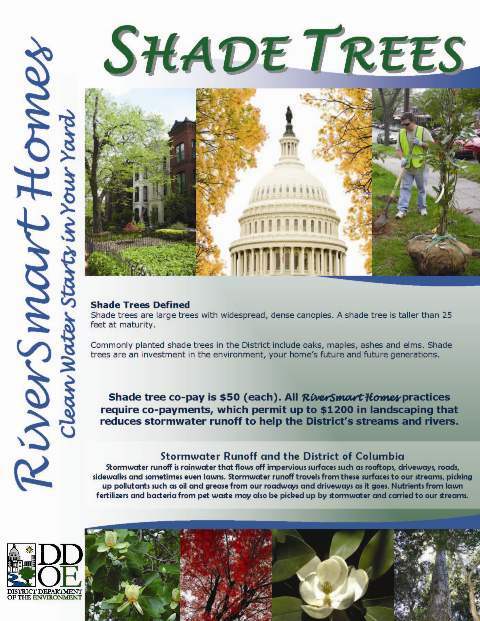 Beginning this spring, Casey Trees through the DDOE's RiverSmart Homes program, will plant shade trees on the property of DC homeowners for $50.00 per tree. There is no limit to the number of trees that can be planted. Front yard, side yard, back yard. No problem. Here is how the program works. Complete and submit the short online contact form. Wait patiently. In late winter/early spring 2010, a Casey Trees representative will contact you to schedule a tree siting to discuss which tree species and locations in the yard help meet your goals. Homeowners will be able to select from a list of 10-12 shade trees with the help of the Casey Trees representative. Right Tree, Right Space, Right at Home principals will guide the tree selection. Once the species and locations are agreed upon, Casey Trees will then schedule the planting for between March and May. Only homeowners in the District can take advantage of the RiverSmart Homes program. If you want to plant trees at an apartment building, coop, church, school, etc. located in DC and can identify locations for ten or more trees to be planted you can apply for a Community Tree Planting (CTP). Casey Trees provides the trees, tools and technical assistance for free. Now what if you want to plant a tree that is not included on the RiverSmart Homes tree list? Another no problem. You can still take advantage of Casey Trees Tree Rebate. Purchase and plant a tree at your home and you can receive up to $50 back per tree (limit 3 trees per property). The only trees that are ineligible are Ash trees and invasives. Another great tree planting program is the Treescape Design Workshop where Casey Trees Staff will help you design a custom treescape plan for your yard and then deliver a shade tree to your home – all for free. The next workshops will take place on Tuesday, March 11 and Wednesday, March 31, 2010. Register today. For more information or to sign up for the RiverSmart Homes program, visit the DDOE website.